WHY DIDN’T I THINK OF THAT? Here you will find tips and hints on all manner of things around the kitchen. I can’t take the credit for some these tips and hints but thought they’re too good not to pass on. Equally, I would be interested and pleased to hear some of yours. Thickly slice and dice fresh oranges or tangerines, limes and lemons and freeze ready for use in summer drinks instead of ice cubes. I freeze and store mine in resealable freezer bags. Going on a picnic? Make up a plastic bottle of fruit squash the evening before and pop in the freezer overnight. 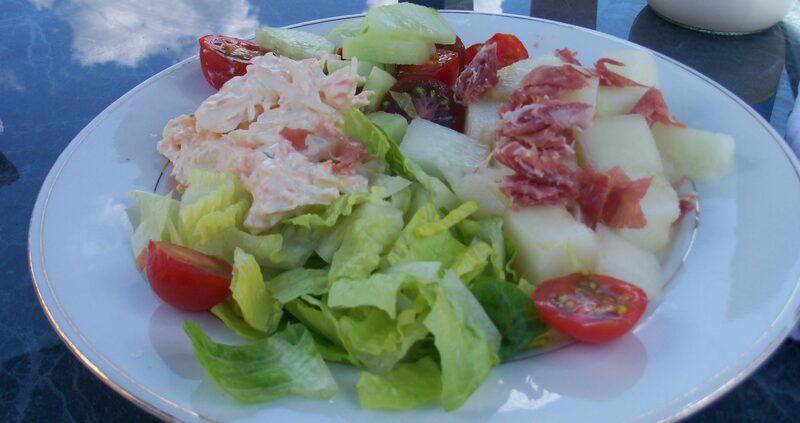 By the time you eat your picnic, your drink will be thawed and nicely chilled ready to enjoy. Hull strawberries easily using a straw from below. Instant cupcake carrier – cut crosses into a box lid. 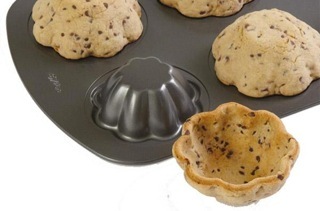 Turn your muffin pan upside down, bake cookie-dough over the top and voila, you have cookie bowls for fruit or ice-cream. Tip: Can’t open that maddeningly tight lid on a jar? Then use a can opener. No, I’ve not lost the plot. 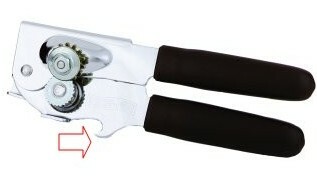 Most manual can openers have a bottle opener (see illustration). Hook this under the lid and lift as if taking off a bottle cap. This will release the vacuum in the jar and allow the lid to be unscrewed in the normal way. Tip: Want to make a cake and recipe calls for castor sugar or soft brown and you only have ordinary or demerara? Use whatever you’ve got! Sugar is sugar no matter what form, even icing sugar will work. In fact, I prefer using demerara in all my cakes and sponges, it adds to the flavour and colour too. Tip: Does your butter go rancid in the heat yet if you keep it in the fridge it is rock hard. Instead of putting a whole block of butter out, keep only small amounts in the butter dish, say a quarter or half block. That way, it gets used quickly and the butter is always fresh. Unless, that is, you honestly prefer the oil-based concocted whips that spread straight from the fridge or you like playing games with the microwave guessing how long the butter will take to soften before melting, and melt it usually does. Tip: Never run out of fresh milk again by always keeping several pints in the freezer. Milk freezes well. It does look yucky when frozen but returns to normal and thaws swiftly. Other than that, you may have to buy a cow. Tip: Fed up with cleaning the oven floor? All those horrible burnt on bits? The smoke? The spray cleaner fumes? A pain in the proverbial to kneel on floor to clean, even worse trying to get back up? Do what I do. Place a large, cheap or past-its-best baking tray on the oven floor and leave there. Take out and wash occasionally or chuck in dishwasher every now and again. When it gets really bad, place in dustbin and buy another tray. Sorted. Thanks for this – never knew about the copper coin for drooping tulips. I’m going to try that in my droopers now. Copper coin certainly stops them drooping. Not sure if will resurrect droppy ones tho. Let me know if it works! Thanks Sylvie – when it comes to cakes I need all the tips I can get. Having said that. always thought caster sugar ‘mattered’. Mum whizzed ordinary sugar in a grinder for a couple of seconds – cheaper than buying the real stuff, but can quickly go from caster to icing! I throw in whatever sugar I have to hand. Dave prefers my sponges made with demerara instead of caster, says it tastes better, likewise I never use unsalted butter except for butter icing!